This design is likely to date at about the time of an estimate of £1400 for completing the Orangery and Grotto in a larger estimate of 'the remainder of the Buildings to compleat the new Quadrangle at Hampton Court datable to December 1693' (Wren Society, IV, p. 57). The source for the design is an engraving by Jean Lepautre of the Grotto of Thetis at Versailles of the mid-1670s (demolished 1683). The Versailles grotto was a three-arched recess with rock-style rustication, and with a central figurative group on a Neptune theme. 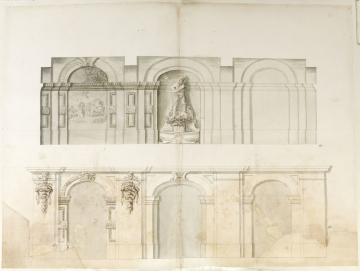 Hawksmoor's responsiblity for the drawing can be established from comparison with his drawings for the Bridge and Portal for Queen Mary of September 1694,which have similar freehand pen drawing and wash shading (110/19-21).The central sculptural group in the recess is of Neptune astride two dolphins on a sea shell above the head of a sea creature, from whose open mouth water flows into a large oval basin. The Neptune recess is wider and deeper than those on either side, the left of which is drawn with a mural relief or painting of a scene of a sea goddess (Thetis?) on a chariot drawn by trumpeting sea gods and mermaids; above in the tympanum is a pasted-down revision for the relief panel, showing a central vase on a spiral base, draped with swags of flowers and with what appear to be sea fruits on the right side.The piers of the recesses have panel mouldings formed in sea shell motifs and central blocks with frosted rustication. The mouldings of the imposts have sea shells along their top course and acanthus leaf below, marked by horizontal shading bands.On the front elevation to the Grotto the piers separating the bays have pulvinated friezes and, above, cornices that run with that of the interior ceiling. Neptune-like mascarons are drawn on the friezes of the two left-side pilasters and these carry rings, from which are suspended drops of shell, drapery and foliage motifs which Hawksmoor has deleted from the design in scribbled pen lines.Although a water channel, or culvert, was constructed to link the the fountain in the centre of the quadrangle with the proposed fountain in the grotto, and beyond this to the outer culvert that runs around the Privy Garden and Park fronts, the grotto fountain was never built.